Uric acid, a byproduct created when the body breaks down compounds called purines during digestion, can build up in the body, forming painful crystals between the joints. This condition, known as gout, is more likely to occur in men over 40, people with high triglycerides or metabolic syndrome, those with a family history of the condition or people who drink too much alcohol. Although diet doesn't cause gout, what you eat can make a difference in the severity of your symptoms. Although some vegetables contain purines, which are broken down into uric acid in the body, eating purine-rich vegetables might not make your symptoms worse, according to a study published in "PLoS One" in 2012. Of the purine-rich foods, only meat, not seafood or vegetables, increased blood levels of uric acid in this study. This means people suffering from gout may not get any benefits from limiting or avoiding purine-rich vegetables, although doctors often still advise this practice. Vegetables don't tend to have a very high purine content, but some are moderately high in purines. 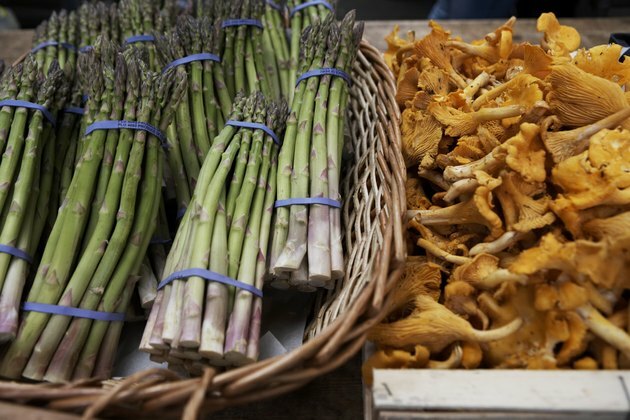 These include asparagus, mushrooms, cauliflower and spinach, as well as dried beans and lentils. Drugs.com recommends eating no more than 1 cup each day of beans and lentils, and no more than 1/2 cup each day of the other purine-rich vegetables, if you suffer from gout. The University of Maryland Medical Center recommends people with gout also limit the amount they eat of vegetables containing oxalates. Up to 25 percent of people with gout also develop kidney stones, and limiting these vegetables may help limit your risk for certain types of kidney stones. Excess oxalate is one of the most common compounds that causes kidney stones. Vegetables that contain oxalates include okra, leeks, beets, sweet potatoes, Swiss chard, beet greens, soybeans and lentils. People with gout shouldn't limit the overall amount of vegetables they eat but may want to try choosing vegetables that aren't sources of oxalates or purines to see if their symptoms improve. Other foods may play a more important role. For example, sugar-sweetened beverages may increase gout symptoms, while dairy products may decrease these symptoms, according to the 2012 "PLoS One" study. The University of Maryland Medical Center also recommends avoiding alcohol, drinking plenty of water, limiting processed and refined foods and eating more foods high in antioxidants and fiber.